Political reporter and producer, Stephanie Hamill was been working in media and politics even before she finished her studies. 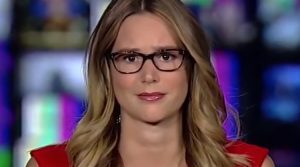 Best known for reporting on the ‘Daily Leger Show’ on One America News Network (OAN), the straight talking presenter is more than ‘just a pretty face’, although she’s certainly an attractive TV personality. Stephanie regularly speaks out about topics and causes she sees as important. Stephanie was born and raised in Oro Valley, Arizona. A bilingual, she speaks Spanish and English. Parents : Her father is from England, while her mother is of Mexican heritage. After landing her job with OAN, she moved to San Diego, California. In 2018, she headed to Washington D.C. after starting up with the FOX 5 DC Network. Stephanie studied at the University of Arizona & graduated in 2010 with a degree in Broadcast Journalism. During her school years, she was pretty active. She became a member of the National Association of Hispanic Journalism, the Society of Professional Journalism and the Journalism Student Advisory Council. Somehow, she also found time in her busy schedule to volunteer with the ‘Foundation for Animals in Risk’ & intern with ‘Tucson City Council’ from August to December 2008. In 2010 she interned again, this time for Arizona Capitol Television as a Reporter / Technical director on live broadcasts. Fresh from university, Stephanie joined the Rodney Glassman’s 2010 US senate campaign in Arizona as the Assistant Political Director. Her position on the winning campaign lasted for 7 months. She was then hired by Arizona Public Media as a Multimedia reporter and producer. During her 5 months with Arizona Public Media, from Jan – May 2011, she was the editor for Arizona Connection. Here, she edited segments for Arizona Illustration, captioned episodes of ‘The Desert Speaks’ & prepared videos and images for online broadcasts. In June 2011, Stephanie made her debut as a TV anchor and reporter for Arizona based TV network KSWT News 13. During her 2 years with the station, she was seen reporting from a number of locations across the state. Some of her most significant report covered ‘The Figueroa Murder Case’, ‘The Dome Valley Double Suicide’ and Preston Alton Strong’s trial for murder. Stephanie joined the team at OAN in June 2013 as a political reporter, producer & a fill-in host. Besides reporting in front of the camera, her responsibilities with the popular news channel include script writing, video selection and editing, updating social media platforms, booking guests and research. In Jan 2018, she left OAN and headed to FOX 5 DC, where she co-hosts the show ‘LIKE IT OR NOT’. The striking OAN reporter has won Prntly’s ‘Most Beautiful Anchor’ award for two consecutive years, in 2015 & 16. She also made the list for CDN’s ‘30 Hottest Political Women of 2016’. Despite these flattering awards, Stephanie is said to be ‘modest and dignified’ about her obvious good looks. A strong conservative, she allegedly supported US President, Donald Trump, in the early stages of his campaign. A fan of American radio host, Michael Savage. Wedding / Husband / Dating / Marriage / Boyfriend No confirmed information about this is available with us. Stephanie Hamill Birthday / Date of Birth / Age As of 2017, she is in her mid to late twenties (unconfirmed). Great Job on Judge Jeanie! (Mar 30, 19) you nailed it! Love you’re comments & demeanor. I am 64 years old now. A lot of young people like yourself do not know that our U.S. government used to use tear gas heavily during the 1960’s, especially during the African-American riots and especially heavy during the era of Martin Luther King and Robert Kennedy. They used to use tear gas on The Americans on the streets along with water hoses that would push people back. They also used to use tear gas on college students during the Vietnam war protests and, as a matter of fact, during one protest at Kent State University, I believe, if I’m not mistaken, 17 students were killed by live bullets from the U.S. National Guard when the protest turned violent. Tear gas is nothing new and it has been used frequently, as I said, on our own Americans. What makes other countries think that we will not use it on them for our national security? Next time that you all mention that migrants are trying to cross here into the U.S. illegally by force and we used tear gas on them, please go back in history and mention how many times we used tear gas, billy clubs and rubber bullets on our own citizens. Look at the Paris riots right now with the police using, tear gas on its own people who are protesting there. Also, having open borders is akin to leaving your house open when you leave, leaving your car windows wide open when you park, leaving everything open so the world can come in and look at it and take it – I don’t think anyone wants that? This problem should have been stopped way back in the 1960s and I remember when the illegals were sneaking in here and I remember how they were making fun of our government. I was a young man at that time and remember illegals coming in and telling everybody to come over and have babies and become American citizens, get free welfare and housing, medical care, etc. A lot of illegal women used to come in and look for American soldiers or veterans and marry them for their benefits. After a while when the women were legalized, they would divorce the American man and bring their Mexican husband and then the Mexican kids over illegally. I remember those days vividly but you all are too young to remember because you were not in that era and saw everything like I did. I remember being about 10 or 12 years old when I had a comprehension of what was going on. I am glad we have a president like we have now, President Trump is right man for the right time. This women’s views are so distorted from reality. It’s very sad she’s given a platform to spread such biased information. I’m not surprised people listen to her though. White republicans love their privileged white girls, it helps them feel safe in their white privilege bubble. First, you must be a liberal, since you have to use such foul language. Second, to wish someone’s daughter to meet men like Donald Trump, i.e., successful business billionaire, and President of the United States is quite an honor. Theresa Stucke, when you use language like that, you lose any shred of credibility. I’m embarrassed for you. There’s no excuse for you to say those things about these accomplished ladies. I can only imagine it’s your own failure as a person that would draw such hateful comments. Shame on you & your kind. I wish this network was in Canada too, fakes news up there is actually worse than here….scary concept. Miss potty mouth Stucke. You are so intolerant and insensitive to Stephanie. You hurt her feeling and that was not a warm fuzzy progressive liberal response. You are also an intolerant racist making fun of her Mexican heritage and that she is a racist. That was not not kind and humanistic of you. What would the most kindest honest human rights activists like Hilly and Billy and Barry think? You need to be more intellectually honest and less emotional like the rest of your liberal peace loving and world globalists friends. Keep up the good work! Keep fighting the bad fight it only inspires the rest of us to see the stuff you are are made of. so be happy in your safe in global villAge and sanctuary city of your mind. I just started watching OAN when I switched cable companies, which was about the time I started questioning FOXNEWS and their runto the middle with their bimbo hosts and guests that blather and annoy conservatives. 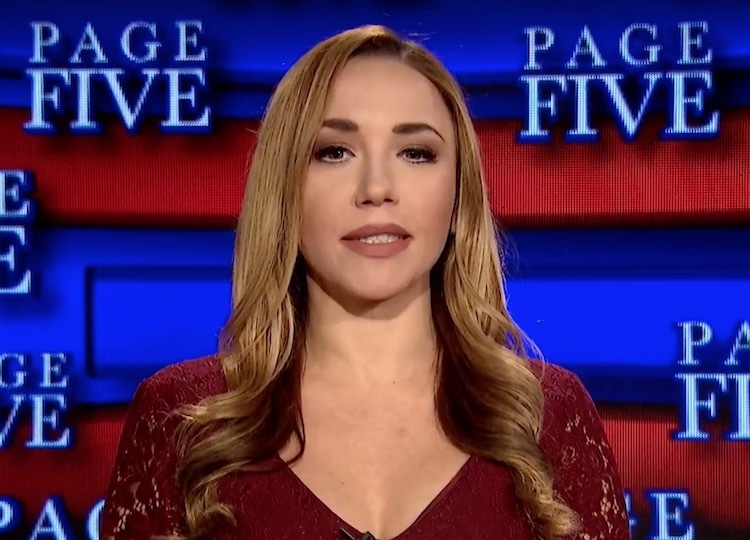 Liz, Stephanie, Graham and the rest are top notch, and when 30 minutes is up, you have really heard a lot more relevant news with conservative insight. FOXNEWS has really deteriorated . Only a few shows I still enjoy. They forgot how to really debate and expose, for disinfecting needs, the progressive toxic politics that is ruining our country. Bill O’Reilly used to do that but he became irrelevant long ago. David, as you know by now, Liz was gopne for 2 weeks to get married and have a short honeymoon. Steph is great and they both deserve to have their own show. OAN could sandwich poor Graham between Steph and Liz? She’s an outstanding news broadcaster and I truly believe she should have her own show! She and Liz Wheeler along with Graham Ledger are great personalities! I’ve pretty much switched over to OAN from FOX. Since they found a way to get rid of Bill Oreilly, they are gradually turning into another liberal biased station. I know OAN probably doesn’t have the money to get Oreilly but I believe if you did along with your current personalities, IAN would shoot right to the top in ratings. I think Bill got a raw deal and he still has a huge following. Anyway please keep up the good work OAN. It’s very much appreciated. I totally disagree with you. O’Reilly played the fence too often and he believed the fake B/C Obama introduced! I totally disagree with you! Bill O’Reilly plays the fence too often and he admitted that Obama’s fake Birth Certificate was real. He should have known better!! Great commentator and news woman.